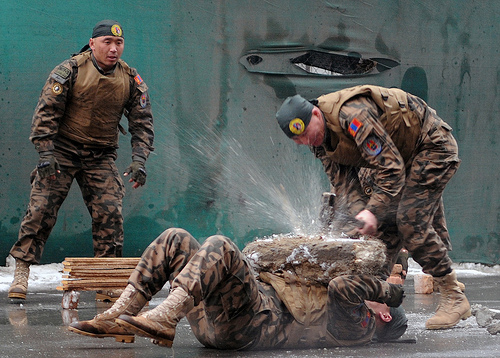 A Mongolian service member uses a sledgehammer to smash a concrete block off the chest of another serve member during a martial arts demonstration by Mongolian military forces at the Mongolian Day ceremony Feb. 18, at International Security Assistance Force Headquarters in Kabul, Afghanistan. According to ISAF, Mongolia has been part of the mission since 2010, contributing more than 100 troops in Afghanistan. They are involved in the training of Afghan National Army in Kabul and providing stability and security to Afghan populations in the northern part of the country. Mark A. Pekala, a career member of the Senior Foreign Service, is currently the Director of the Entry-Level Division in the Bureau of Human Resources. Previously, he served as the Deputy Chief of Mission in France (2007-2010), Deputy Assistant Secretary of State in the Bureau of European and Eurasian Affairs (2005-2007), and the Deputy Chief of Mission in Estonia (2002-2005). In 2001, Mr. Pekala was Director for Russian Affairs for the National Security Council. Mr. Pekala’s previous Washington posts have included: Senior Watch Officer in the Department of State Operations Center; Special Assistant to the Ambassador-at-Large for the New Independent States; and Russia Desk Officer. Additional overseas assignments have included: First Secretary to the U.S. Mission to NATO in Belgium; Political Officer in Azerbaijan; and a Consular Officer in Poland. Mr. Pekala received a B.A. from the University of Michigan, an M.I.A. from Columbia University, and an M.Phil. from Columbia University. If confirmed, Mr. Pekala would succeed career diplomat, Judith Garber who was appointed by President Obama to the US Embassy in Riga in 2009. Makila James, a career member of the Senior Foreign Service, currently serves as the Director of the Office of Caribbean Affairs at the Department of State. From 2007 to 2009, she was the Deputy Director of the Office of Southern African Affairs. From 2006 to 2007, she was the Principal Officer of the Consulate General in Juba. Previously, Ms. James was a member of the State Department’s Policy Planning Staff from 2003 to 2006. Other positions in Washington include: Research Fellow at the Georgetown University Institute for the Study of Diplomacy; International Relations Officer in the Office of International Organization Affairs; Desk Officer in the Office of West African Affairs; and Watch Officer at the Operations Center. Overseas assignments include: Political Officer in Zimbabwe; Political/Economics Officer in Nigeria; and Consular Officer in Jamaica. Ms. James received a B.A. from Cornell University, a Masters in National Security Studies from the National Defense University, and a J.D. from Columbia University Law School. If confirmed, Ms. James would succeed career diplomat, Earl Irving who was appointed by President Obama as chief of mission to the US Embassy in Mbabane in 2009. US Embassy Caracas: Where do I begin, to tell the story of how bad a post can get? In 2007, the State Department’s Office of the Inspector General conducted an inspection of the US Embassy in Venezuela. At that time, the inspectors determined that 1) skillful leadership of a focused and imaginative Ambassador has kept the U.S. government as effectively engaged as possible in Venezuela; 2) The Ambassador and DCM have worked through an outstanding and empowered regional security officer (RSO) to instill an admirable culture of security at Embassy Caracas – a post operating in a critical threat environment; 3) The energetic consul general manages an efficient, cost-effective operation that emphasizes staff cross-training and cooperative public outreach with other mission elements. More here. It was generally a good review. Lengthy staffing gaps in the front office have undermined mission oversight and contributed to management deficiencies and poor morale. Now that the front office is fully staffed, the chargé and the deputy chief of mission (DCM) are addressing these shortcomings. Past inadequate front office oversight, prolonged staffing shortages in key management positions, weak section leadership, and lack of a customer service focus combined to produce significant deficiencies in support. The information management program faces immediate challenges. Bandwidth limitations and diplomatic mail operations, in particular, require urgent attention. The consular section is emerging from an lengthy period of ineffective leadership. [REDACTED] The challenge has public diplomacy, security, commercial and management ramifications. Political and economic reporting has been effective, despite restricted access to Venezuelan policymakers. More analytical reporting is needed. The public affairs section (PAS) has a robust program, including a network of effective binational centers that take the embassy’s message nationwide. However, the PAS needs to develop formal written media engagement and alumni outreach plans. The embassy has been without an ambassador since July 2010 and is short staffed in key areas. Staffing is complicated by a preponderance of first-tour, entry-level officers (ELO) and inexperienced LE staff, because of attrition caused in part by low local salaries. Both permanent staff and temporary duty support visits have been restricted by Venezuelan visa issuance, which impinges on mission operations. Between July 2010 and October 2011, the two interim chargés, including the current DCM, relied upon a series of acting DCMs, which contributed to inconsistency and confusion regarding internal direction within the mission and interactions with Washington. While performing front office duties, embassy section heads could not provide consistent supervision for their sections nor adequate mentoring to junior staff. As noted in the Executive Direction section, the front office is committed to the embassy’s MSRP [Mission Strategic and Resource Plan] goals. However, few political and economic ELOs report having read the MSRP. Discussions with section heads suggest that the MSRP is viewed as less relevant to their ongoing reporting and is given little emphasis. They indicate that the plan cannot anticipate reporting on the erratic Chavez government and that opportunities to influence the Venezuelan Government are so limited that some MSRP targets are unrealistic. In all Department sections, but especially the consular section, there is a preponderance of first-tour ELOs. In an environment where surging workload and local government hostility combine to fundamentally challenge the mission, recruiting more experienced ELOs would make a difference. With some 250,000 applicants, Embassy Caracas is one of the top 10 nonimigrant visa (NIV) processing posts in the world. In the past five years, visa demand has grown by 77%. [REDACTED] According to the U.S. Department of Commerce, Venezuelan visitors spend approximately $2.5 billion in the United States each year, mostly in Florida. By not meeting visa demand, potential tourism export earning (and U.S. jobs) are being lost. A diligent but overextended visa chief manages the unit, supported by a talented deputy. LE staff expressed concerns about the lack of attention to customer service and to factory-like working conditions in the visa unit. The visa chief and deputy have recently introduced a thorough orientation and training program for incoming ELOs, all of whom are first-tour officers. The commulative effect of an appointment system, convoluted entry process, and crushing backlog, combined with the inevitable staffing gaps and computer system problems, means that consular managers are constantly struggling with resource [REDACTED] challenges. Management services are incoherent and customer service is poor. Client feedback unanimously points to frustration with lack of information and clarity from service providers, from pre-arrival to post-departure. Management policies and notices do not contain clear information on what the client should expect or where to go for help. Lines of responsibility and authority are so blurred within management functions that no one is clearly accountable for any given task. The management counselor has not clearly defined the responsibilities of each section nor held individuals accountable for their performance. And nobody knows about nonacceptance of free labor? The embassy has accepted volunteer work and, on occasion, has asked eligible family members to perform official tasks without compensation. Eligible family members routinely begin work prior to being officially cleared and processed for employment. The Antideficiency Act1 prohibits the acceptance of voluntary services and generally allows uncompensated services only under narrowly defined conditions, such as the 5 U.S.C. § 3111 exception authorizing acceptance of voluntary service from students. The embassy’s required Designation of Responsibilities document available on the Internet is dated September 2004. That’s the one that says which officer is responsible for what. The OIG report did not say if this document had been updated since 2004, or if it is available but not disseminated. The FSN handbook was written in 2005 and is terribly out of date. Hotel and restaurant survey which is used for lodging and meals and incidentals expenses for per diem rates have not been updated since January 2006. Caracas was #100 in the most expensive cities in the world for expatriate employees in 2010, and was ranked #51 in 2011. Embassy Caracas has not submitted an updated education allowance survey since 2007. The Department’s Standardized Regulations requires completion of Department form DS-63 report annually for each school that U.S. Government dependents attend. FSN staff members throughout the mission have never received training, including those in need of technical skills in general services, human resources, and financial management. 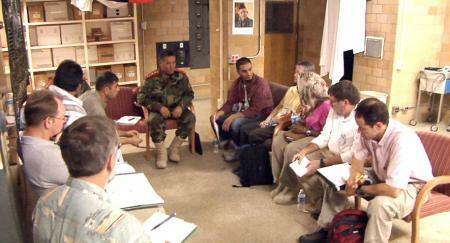 The mission policy on training dates back to 2004. One bright light in this report is that of an Assistant Regional Security Officer for Investigations whose cooperation with working-level local law enforcement entities, resulted in 50 arrests and fewer fraudulent documents submitted with visa applications. His investigations into visa malfeasance also led to the dismissal of three FSN staff members in 2010. The most recent Ambassador to Caracas was Patrick Duddy who served from August 6, 2007 to September 11, 2008, during the Bush Administration, and was expelled by Venezuelan President Hugo Chavez. Eight months after that he was returned as Ambassador to Caracas by the Obama Administration. He left the mission on July 2010. That same month, Larry Palmer was nominated by President Obama. By December 2010, the Venezuelan Government had withdrawn its agrément on the appointment of Larry Palmer to Caracas. Former U.S. Ambassador to Guatemala, James M. Derham, who retired from the Foreign Service in 2008 after a career of more than 30 years is the current Chargé d’Affaires, and just one of the interim chargés temporarily assigned to Caracas since 2010. I don’t know how much longer he will be in Caracas or if he can effect a mission turnaround during a limited assignment. Ambassador Richard Norland, a career member of the Senior Foreign Service, serves as the International Affairs Advisor and Deputy Commandant at the National War College. From September 2007 to July 2010, he was U.S. Ambassador to the Republic of Uzbekistan. Prior to which, he served for two years as Deputy Chief of Mission at the U.S. Embassy in Kabul, Afghanistan. Additional overseas assignments have included: Deputy Chief of Mission in Riga, Latvia; Diplomat with the U.S. Army Civil Affairs team in Mazar-e-Sharif, Afghanistan; Political Counselor at the U.S. Embassy in Dublin; and Political Officer at the U.S. Embassy in Moscow. He was Director for European Affairs on the National Security Council for two years during the Clinton and Bush administrations. Ambassador Norland has a B.S. from Georgetown University School of Foreign Service and master’s degrees from Johns Hopkins University School of Advanced International Studies and National War College. A better outline of his previous assignments is here. He served two years in Kabul and presumably a year in Mazar-e-Sharif. Ambassador Norland speaks French, Russian, Norwegian and Latvian. He and his wife, Mary Hartnett, have two children. 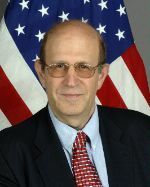 If confirmed, Ambassador Norland would succeed career diplomat, John Bass who was appointed by President Obama to the US Embassy in Tbilisi in 2009. No political appointee has yet succeeded in getting appointed as US Ambassador to Georgia. According to USAToday, a gunman killed two American military advisers with shots to the back of the head Saturday inside a heavily guarded ministry building, and NATO ordered military workers out of Afghan ministries as protests raged for a fifth day over the burning of Qurans at a U.S. army base. The LA Times reported that the details of the killings of the two Americans Saturday remained murky hours after the shooting. Although the NATO’s International Security Assistance Force confirmed the deaths of two of its service members in Kabul, it did not disclosed their nationalities. However, Afghan officials speaking on condition of anonymity reportedly identified the two as American military officers who were advising the Interior Ministry. Top U.S. military officials said they were still trying to determine the identity of the attacker. But one Western official in Kabul said that the two Americans were shot by an Afghan police official who was upset about the burning of Qurans earlier this week at a U.S. military base. Coalition officials in Kabul dismissed claims by some Afghan officials that the two Americans were killed by a Western colleague. Sediq Sediqqi, a spokesman for the Interior Ministry, said the two American military officers were found dead in a secure office on the compound by one of their colleagues. It remained unclear who killed the pair, or how the attacker got inside the well-protected part of the ministry, he said. But other Afghan, Western diplomatic and military officials said that initial reports indicated that the gunman was a member of the Afghan security forces. KABUL, Afghanistan – “I condemn today’s attack at the Afghan Ministry of Interior that killed two of our coalition officers, and my thoughts and prayers are with the families and loved ones of the brave individuals lost today,” said Gen. John R. Allen, commander of the International Security Assistance Force. “For obvious force protection reasons, I have also taken immediate measures to recall all other ISAF personnel working in ministries in and around Kabul,” continued Gen. Allen. On April 2011, eight US troops and a US contractor were killed by an Afghan air force pilot at the Kabul airport. Officials have been calling these incidents, “isolated cases and are not occurring on a routine basis.” The NYT cited a classified report which found that between May 2007 and May 2011, when it was completed, that at least 58 Western service members were killed in 26 separate attacks by Afghan soldiers and the police nationwide. Most of those attacks have occurred since October 2009. This toll represented 6 percent of all hostile coalition deaths during that period, the report said. This latest attack inside the Ministry of Interior shows that these incidents are not isolated cases perpetuated just by boots-on-the ground soldiers. We have military officers and unarmed civilians working in all parts of Afghanistan ministries – from Agriculture to Women Affairs. The military advisors have now been pulled back, but how about the civilians? Even if they grow eyes on the back of their heads, how can they trust that their Afghan colleagues will not one day pull that trigger? We are wasting our time with frienemies in Afghanistan. It’s time to leave and begin reconstruction at home and not in 2014. It will be appreciated at home. Dear State Dept OIG – Please Stop Playing Hide and Seek with Your Reports! It used to be that we could check the “Featured Items” in the OIG website and get the newest reports straight from the oven. **NOTE: The dates on OIG reports represent the dates the publications were issued/published, not when they were posted to the Web site. The Bahamas, between September 29 and October 12, 2011; and in Providenciales, Turks and Caicos, on October 2, 2011. The report is dated January 2012. And it is now posted in the OIG’s WHA section and the Featured Items section, but we have no idea when it actually went up online. Well, I thought, I’d be damn, I am going blind! How could I have missed that report on The Bahamas when it is right there, there sandwiched between Algeria and the Bureau of Administration/GIS? And then I saw this tweet from the State Department OIG on February 23, 2012 at 9:38 am. Oooh, I am not going blind, after all! 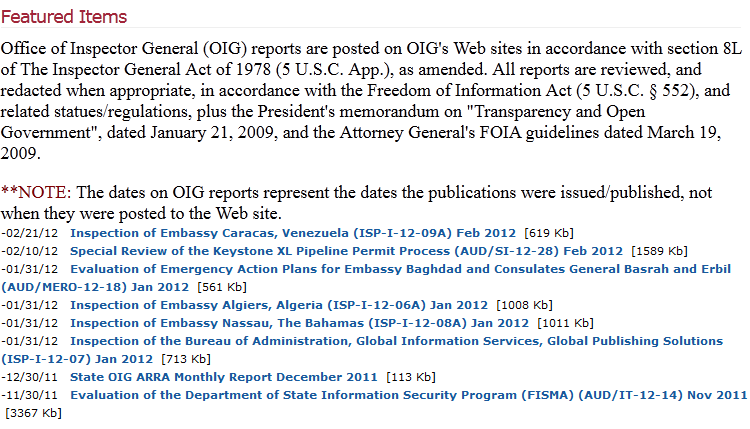 Dear State Department OIG — Folks, you really need to indicate the dates when you put up your reports online, and stop making us play hide and seek with you. You have posted a note that says “The dates on OIG reports represent the dates the publications were issued/published, not when they were posted to the Web site.” Well, that’s no good, because you got redundant dates there that have no other function except potential confusion. Let me help you, it’s really quick and easy. See the red circle below? That should be your posted date. Why? Because your OIG reports are only dated by month and year. The report on The Bahamas says: Inspection of Embassy Nassau, The Bahamas Report Number ISP-I-12-08A, January 2012. See? It did not/not say 1/31/12. So where did that date come from, I’d like to know. And see the red rectangular-ish below? That’s the month and date indicated in the OIG reports. Do we really need two dates there to confused us? And I really hate to think of the possibility that these reports are accidentally “slipped” quietly into the queue. Yes, we really do want to know when these reports are posted for public consumption. You are very welcome!